Sorry it has been so long since a post, but this one is totally worth the wait. Chocolate, Graham Cracker. Raspberry Cheesecake. In. A. Cupcake. Yum.O. I was hired to created Spring inspired cupcakes, and some may say I went a little crazy. I imagined up three types, inspired by three Pantone colors, with three different types of decor. Yes, some say I’m cray, but I’m ok with that. Although they were for spring, a chocolate cupcake was necessary for the bunch, I can’t disappoint my people! So I got to thinking, what can make it “spring”... well the icing color of course! BUT I didn’t want to just dye the icing, that is what I call cheating! So I had to think up something. Hmmm, what goes good with chocolate, well, raspberry of course! BUT let’s take it up one more notch, and make it RASPBERRY CHEESECAKE. BOOM. NAILED. IT. PMS 230 in a cupcake, here we go! 1 / Preheat oven to 275˚F. 2 / Process raspberries in a food processor until smooth, about 30 seconds. Pass puree through a fine sieve into a small bowl; discard solids. Whisk in 2 tbsp. sugar, and set aside. 3 / Beat cream cheese with a mixer on medium speed until smooth. 4 / Add sugar, then vanilla until well combined. 5 / Add eggs, scraping down side of bowl as necessary. Add sour cream and salt. Pour batter into spring form if you have, if not, any pan (I used a 9 inch glass) will do, because it doesn’t matter if the cake stays together, you will need to ruin it anyway! 6 / Bake until sides are set but centers are wobbly, about 45 minutes. Refrigerate 4 hours or overnight. 1 / Stir together the graham cracker crumbs, sugar and melted butter until well combined. 2 / Press 1 tbsp. of the mixture into the bottom of each cupcake liner. 1 / Preheat oven to 350˚F. 2 / Combine butter, chocolate, and cocoa in medium heatproof bowl. Set bowl over saucepan containing barely simmering water; heat mixture until butter and chocolate are melted and whisk until smooth and combined. Set aside to cool until just warm to the touch. 3 / Whisk flour, baking soda, and baking powder in small bowl to combine. 4 / Whisk eggs in second medium bowl to combine; add sugar, vanilla, and salt until fully incorporated. Add cooled chocolate mixture and whisk until combined. Sift about one-third of flour mixture over chocolate mixture and whisk until combined; whisk in sour cream until combined, then sift remaining flour mixture over. Whisk until batter is homogeneous and thick. 5 / Divide batter evenly among the graham cracker crust cupcake liners, filling each three-quarters full. Bake until skewer inserted into center of cupcakes comes out clean, 18 to 20 minutes. 6 / Cool completely on a wire rack. 2 / Fill a piping bag with the cooled, set cheesecake*. If the cheesecake is thick and you think it won’t pipe properly, using an electric mixer beat it for about 2 minutes to get a better consistency. 3 / Fill the cored cupcake with the cheesecake and then pipe on the top of the cupcake with your favorite tip! * As you see, I attempted some roses. They all came out a little different! First I attempted this one. I dropped some food coloring along the seam as instructed. I was doing well, but I didn’t let my cheesecake set long enough, so it was a bit loose. Also, I needed to refill my bag, so I wasn’t able to add the food coloring along the seam again, because it was a mess! This video even though it isn’t in English shows how you can do a rose also! I wound up just circling around the cupcake, starting in the center, on many of them, and they were cute too! 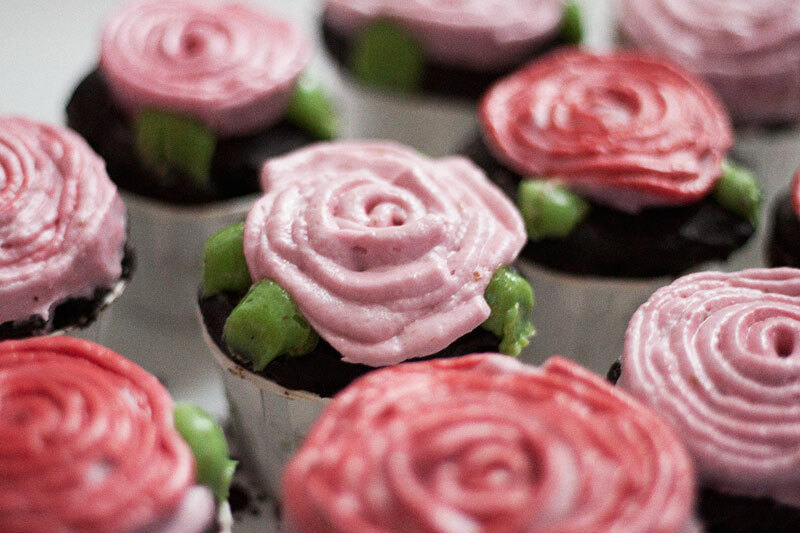 So if you have a super special occasion, you should make these. I understand that the cheesecake adds a whole extra element (and a ton more dirty dishes) but take my word for it, you will put a smile on everyones face! Don't forget to download your free recipe card for keeps! Have you experimented with unconventional icings? I tried pumpkin pie (link) a while ago, and it was a crowd favorite, what else can we cook up?